Saint Patrick Catholic Church | One Heart, One Mind. 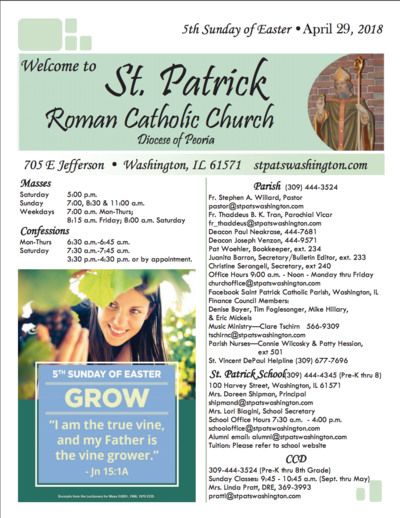 Welcome to Saint Patrick Parish! Thank you to all of our donors, sponsors and all those who helped out and/or attended our Pot O' Gold 2019! inspiring true story to the big screen, giving voice to a woman who has been on both sides of the abortion conversation. Unplanned is the most important movie you’ll ever see on the most controversial issue of our time. No matter which side of the fence you’re on, no one will leave this film unmoved by Abby’s journey. If you had your photo taken, but did not order any photos, please contact the parish office at 309-444-3524. Directories are available NOW in the Parish Office for those who had their photos taken. Looking for a group of women that can support you in your vocation as a mother and help you to grow in your journey with Christ??? THE SAINT PATRICK CATHOLIC MOMS’ GROUP IS WAITING FOR YOU!